How can something this sweet have zero calories? What is this mysterious healthy tea that is 200 times sweeter than sugar? Sweet herb teas are also sometimes known as “Buddha teas”. The base ingredient is the leaf of a particular Asian hydrangea called the jiaogulan (Gynostemma pentaphyllum), which is dried naturally. This herb is well known among practitioners of Buddhism for its medicinal properties, and so it is drunk on the Buddha’s birthday to celebrate good health. Last year this tea was also presented to Queen Elizabeth at her own birthday celebrations and was said to be extremely well received. As the name would suggest, the distinctive characteristic of sweet herb tea is its intensely sweet flavour, said to be roughly 200 times sweeter than sugar. A satisfactory flavour can be gained from a mere three to four leaves, with the sweetness becoming stronger the longer they are left to brew. Using a suitable amount of water you can even make as much as 1.5 litres of tea in this way. Despite its sweetness however, the tea contains no sugars or calories at all, making it an ideal sweetener to use in everyday cooking for diabetes sufferers. It is also relied upon for a myriad of other health benefits, such as easing of high blood pressure, the suppression of allergies and aiding intestinal function. “Buddha” tea is also caffeine free, so it can be given to children without worrying about the risk of obesity. 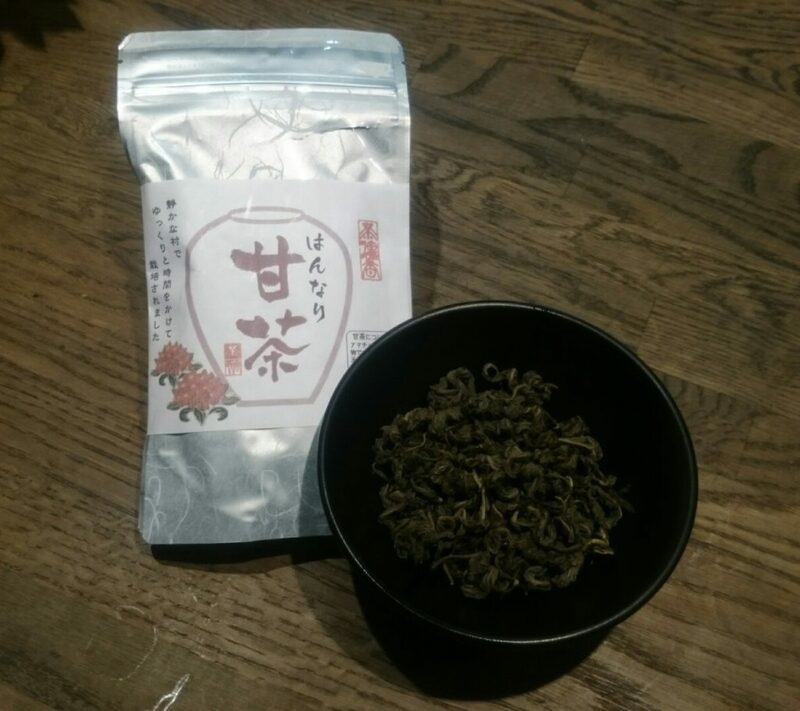 The brand shown in the photograph here is made using especially fine jiaogulan organically grown in northern Japan. Why not try this highly recommended health drink? !